Will and I, were both slightly craving a LARGE bed and a fully equipped bathroom - so we booked ourselves into the exquisite Belveldere Hotel. 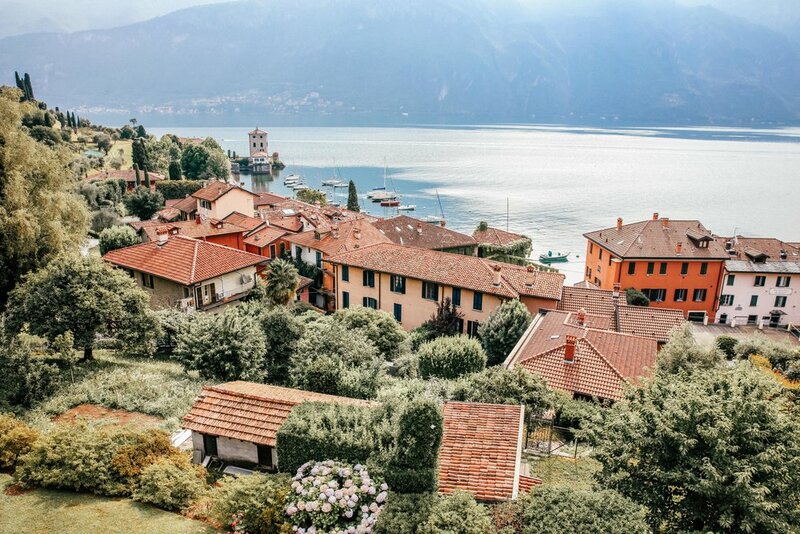 This beautiful family run lakeside hotel, is a 5 minute walk from the center of Bellagio town. There is always something so special about a hotel that has been in the family for generations and this one, excelled on all levels. We were greeted by very welcoming staff and led to our beautiful bedroom looking over the pool and onto the lake. After living in a van for 2 weeks - we were ready for some luxury and this place was the perfect fit! 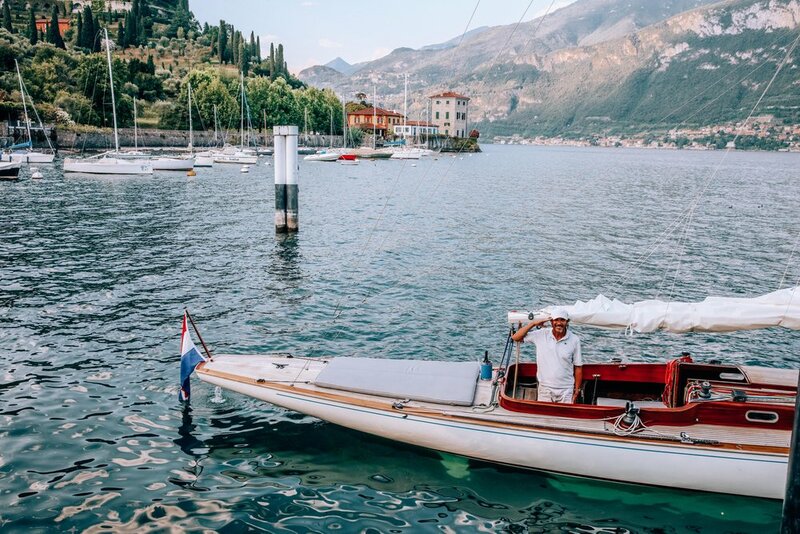 After lounging by the pool and soaking in the views, we wandered towards the lake to have a boat trip with Bellagio Sailing, which had kindly been organised by Hotel Belvedere. 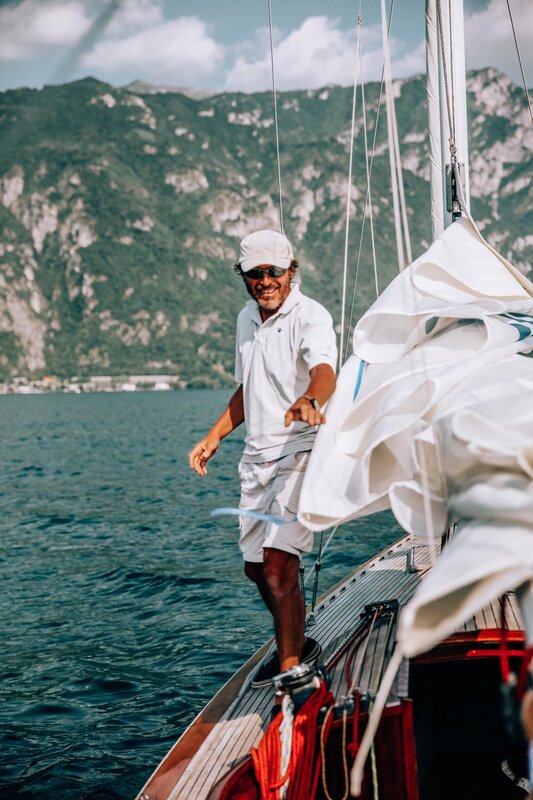 We were greeted by our charming skipper Carlo and his stunning 42 feet boat called Dama di Bellagio - which translates to The Lady of Bellagio! We went sailing at 5.30pm, and were on the boat for 2 hours. We sipped wine, lay on the deck and were shown around the beautiful houses of Lake Como, whilst chatting and getting history from Carlo. Will and I loved our sail so much, that once we got back that evening we started browsing the internet for similar boats, in the hope that one day we'll buy one (hello dreamland)! If you're visiting Lake Como, there is no better to way to see the lake than being on it! 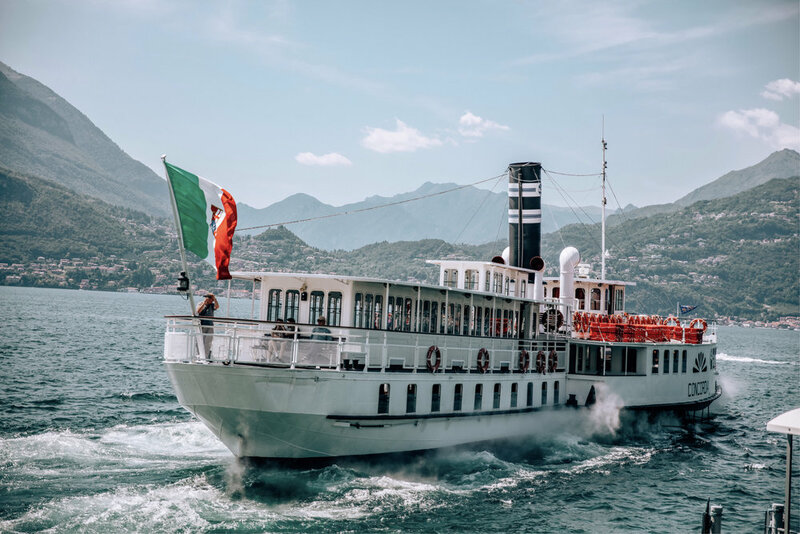 Carlo has two boats, one being the Dama di Bellagio, and the other being called Sleepy, a slightly larger boat - suitable for families with children. I highly recommend taking one of Carlo's boats out for a spin if you're in the area! The food at Hotel Belvedere is renowned for being one of the best restaurants on the lake - so you can imagine our excitement to our three course meal with wine and a view that will stay with me forever! 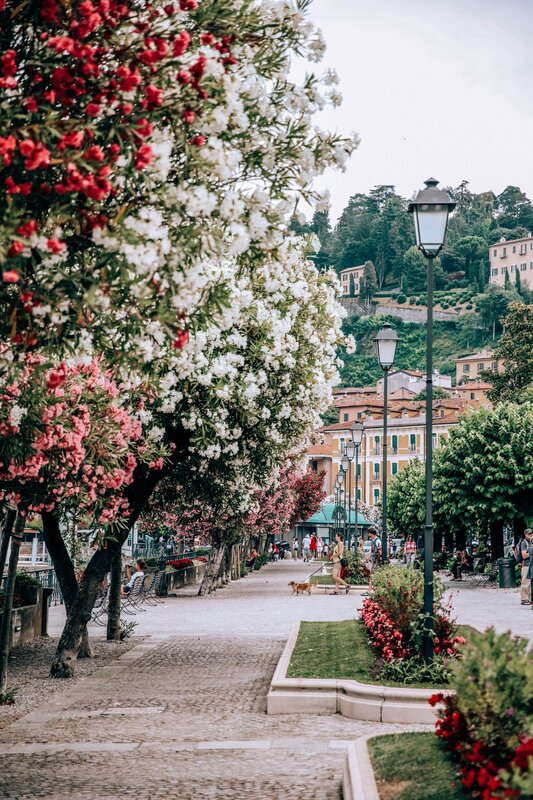 Bellagio, is full of cobbled lanes and large long stair cases, with a promenade of trees that run parallel to the lake. I could have wandered around this town for ages, people watching and making myself sufficiently full with gelato. Whilst in Lake Como, Will and I caught the ferry from Bellagio to other parts of the Lake which included Menaggio and Colico. This is a very easy and cheap way to see the lake and all it has to offer. 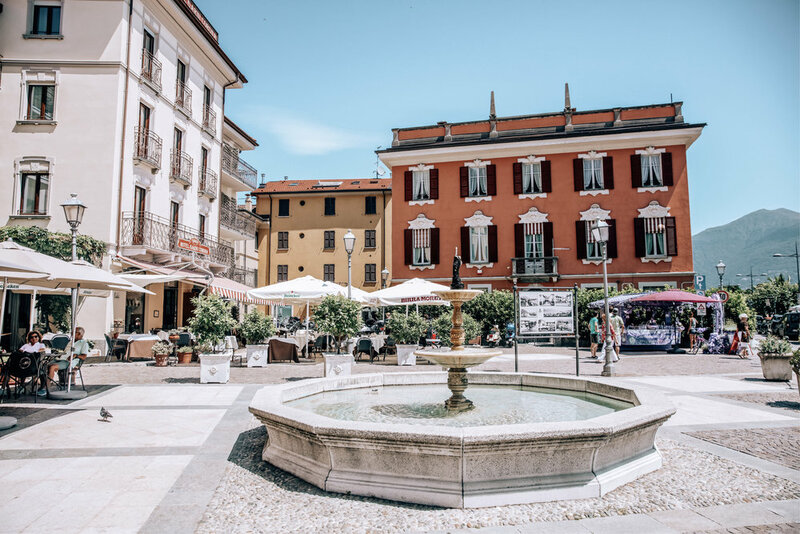 Click here to see the timetable for Lake Como, which is very useful. We had an absolute magical time in Lake Como and can't thank Hotel Belvedere enough for it's wonderful hospitality! We will be BACK! Click here to check out this beautiful hotel. We left lake Como and headed to Venice which was a 3h30 minute drive.